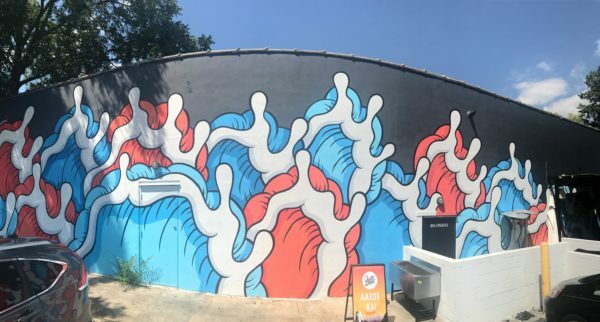 Seventeen new murals are waiting to be discovered, as both local and out-of-town muralists visited Atlanta for the OuterSpace Project (OSP) mid-June. Founded in 2015, OSP is the brainchild of Atlanta street artist Greg Mike. 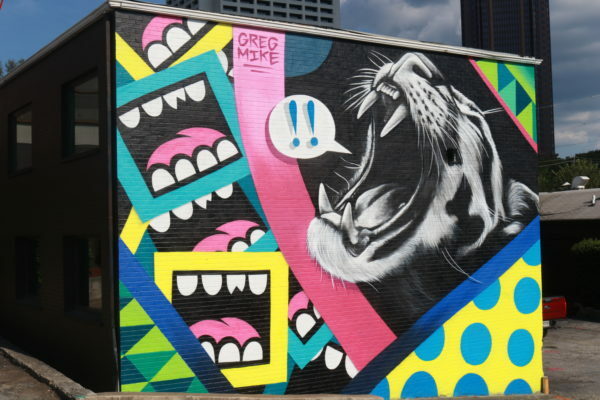 His partnership with Terminal West has led to a rapidly growing, eye-catching event series that unites public art and design with music, action sports and Atlanta’s diverse creative culture. Mike said that his purpose for OSP was to encourage people to get out and discover the city. Spend your weekend with Atlanta’s newest murals and a full dose of inspiration. 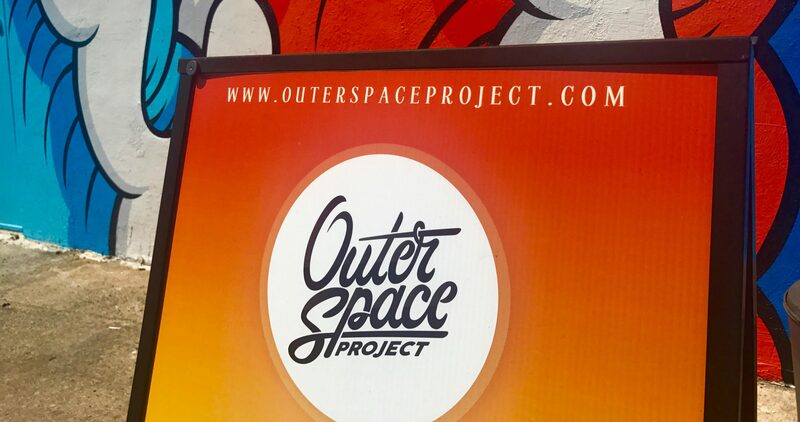 We start our journey through OuterSpace with the project’s founder. Mike’s animated illustrations have taken creative expression to new heights, becoming a staple in Atlanta’s art scene. From his popular Larry Loudmouf character to “bucket list” blank canvases such as cars, houses, and basketball courts—this worldwide artist leaves an unparalleled splash of playful character wherever he makes his mark. His Midtown OSP mural features some of Mike’s mischievous and outspoken creations. Your Spidey senses will tingle as you drive down Boulevard through the busy Edgewood neighborhood. 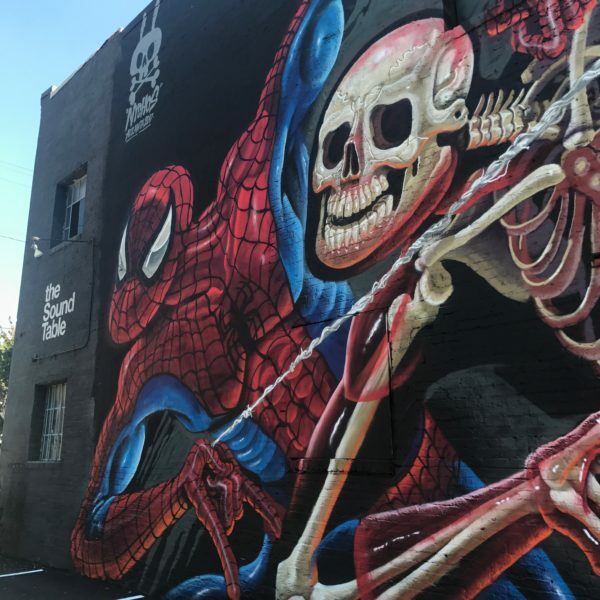 Thanks to the urban art visionary known as Nychos, Spider Man can be seen as a multi-dimensional, dismembered product of creatively abnormal foresight. All the way from Austria, Nychos creates meticulous, anatomic artworks that offer the viewer a look past what ordinarily meets the eye. Exactly one mile east from Georgia State’s Downtown campus, there is an eccentric creature dripping with color and gawking down with large, tweaked-out eyes. It is a product of Patch Whisky’s imagination and one of his many notoriously comical characters. 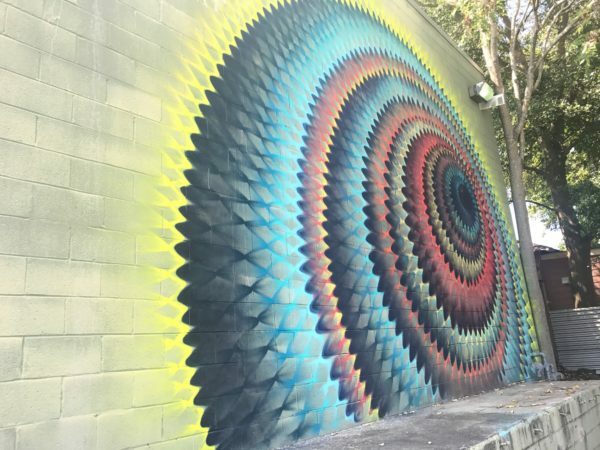 This Charleston, South Carolina muralist takes the phrase “far-out” to new dimensions. The second mural featured at this location was done by Atlanta artist Tommy Bronx. 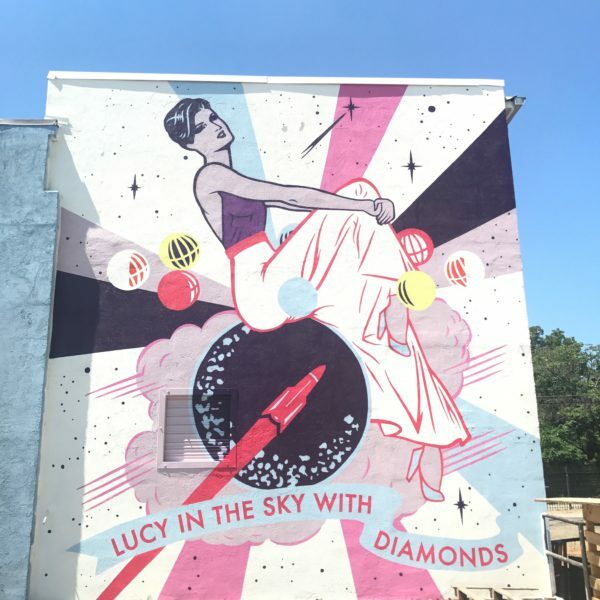 The painting identifies a female face to Lucy from the famous Beatles song, “Lucy in the Sky with Diamonds.” She is classy and poised, floating amongst the planets. Bronx is known for his unique and communicative take on hip hop expressionism. 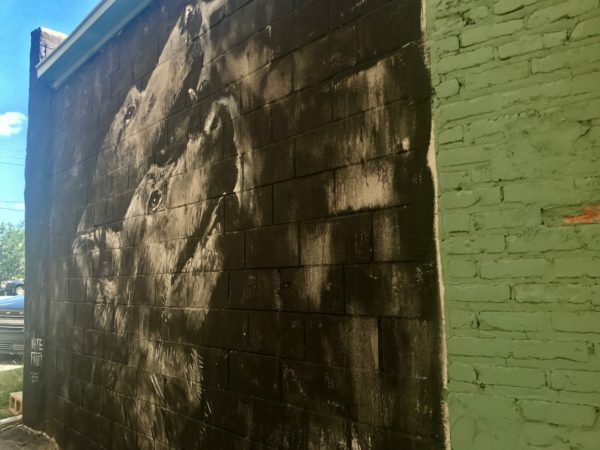 A third wall of the same building showcases an Atlanta-based artist named Wolfdog. His Facebook page says that he was “born and raised by a pack of wild wolves in the deep forest,” but this mural takes the viewer into a dreamlike state far from Wolfdog’s wilderness roots. Nowadays, bridge underpasses are a standard canvas space for street artists. Instead of dark and ominous passageways, the walls come alive with creativity and community dialog. 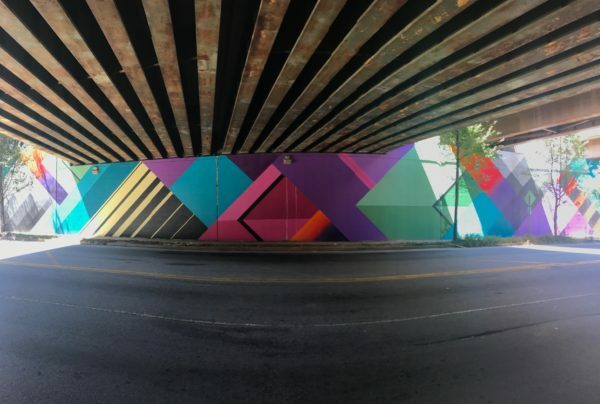 The Dekalb Avenue Tunnel—what was once a lackluster walk through cement corridors—is now a flashy display of color and abstract design. Buenos Aires-based muralist, Nase Pop, came all the way from spicy Latin America to share his funky, eye-catching style with our city. 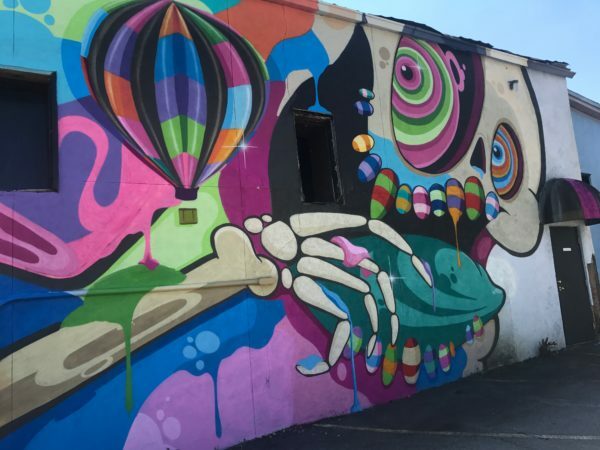 A short ride to the downtown Decatur area will lead you to a mural that showcases the incandescent spirit of island imagination and abstract perspective of Hawaiian artist Aaron Kai. 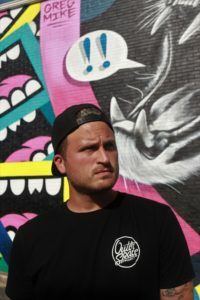 This up and coming international artist represents his culture through bold and animated Post Pop themes. Make your way towards Little Five Points for a Saturday morning cartoon blast from the past. New York City muralist Jerkface created his own take on the classic animated series, Tom and Jerry. 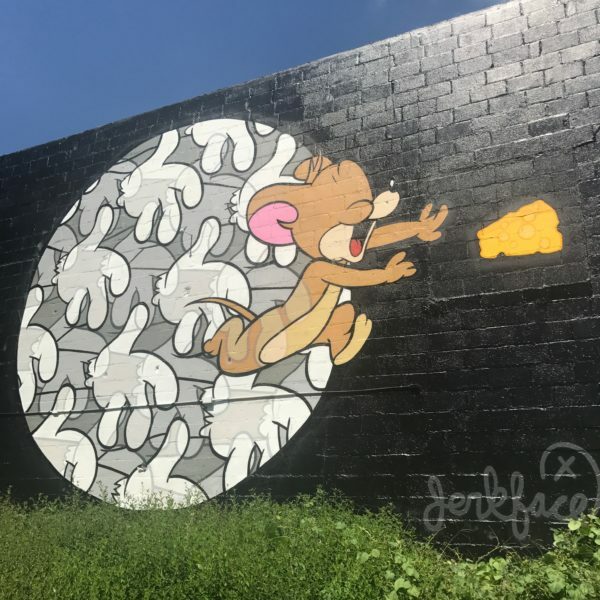 Widely known for his nostalgia-infused interpretations of pop culture illustrations, Jerkface has made a prolific mark on the walls of Atlanta. By re-imagining classic iconography, the artist invites the viewer to connect with their youth from a colorful and offbeat point of view. 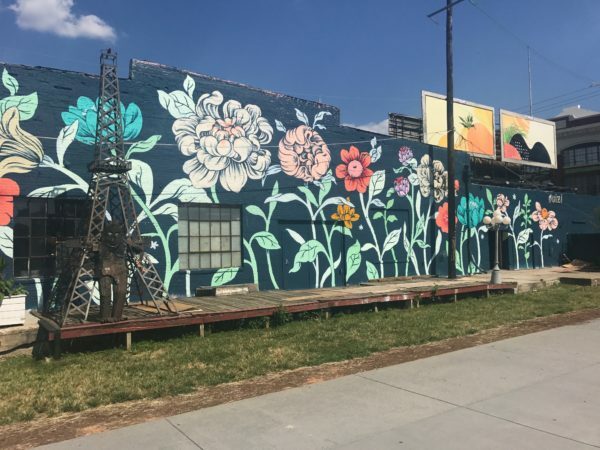 Thanks to Detroit muralist Ouizi, flower power is now in full bloom on the Beltline. A stroll down the Eastside Trail will lead you to the massive, artistic warehouse known as Paris on Ponce. The store’s Beltline entrance is now adorned with a cheerfully vibrant composition of flower blossoms that can make any grueling day of fall semester feel like the first day of spring. Ouizi is recognized for her botanical-themed murals, which manifest lighthearted optimism with their bright and colorful motifs. Another outside wall of the massive Paris on Ponce building features a mural done by Atlanta’s own Thomas Turner. This artist actually takes the viewer to outer space with an enormous hawk landing on the moon. From the walls of our city to dreamy hand painted bedframes and whimsical wood panel paintings, Turner’s surrealistic style is definitely something out of this world. 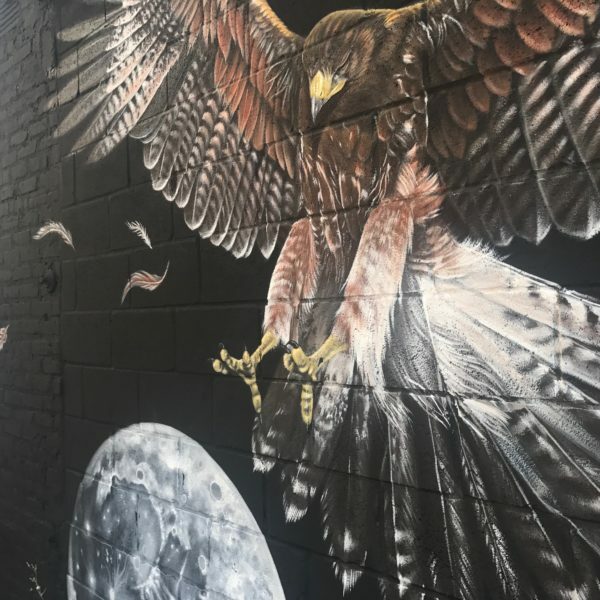 You don’t have to leave the area—or the building for that matter—to see yet another mural from OSP that showcases wildlife at its finest. Atlanta-based artist Nate Frost painted a double headshot portrait of a wolf—so realistically eerie that it will have you howling for the moon before the sun sets. 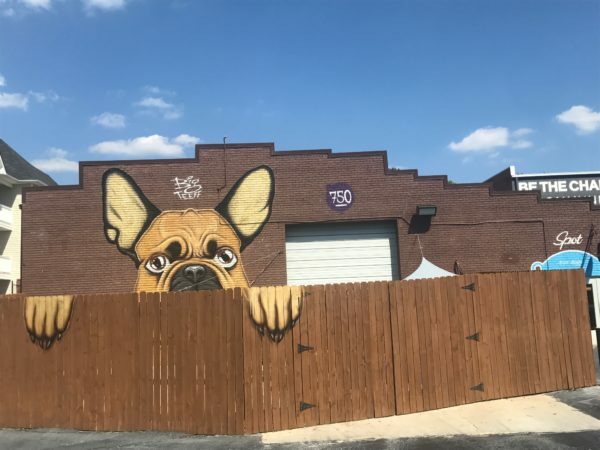 While continuing to make your way down the Beltline’s Eastside Trail, you will spot a canine creation peeping over the fence of a doggy daycare center called Spot for Dogs. 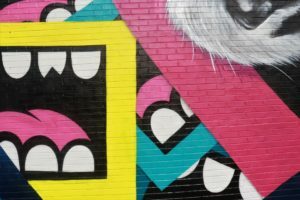 Although, this is no real life pooch, it is a fantastically creative, multi-dimensional mural by Atlanta artist Big Teeff. The best part is that this French Bulldog’s eyes seem to interactively move in your direction as you walk along the trail. A captivating, colossal-sized woman and her wolf companion now gaze down at Oakland Cemetery. 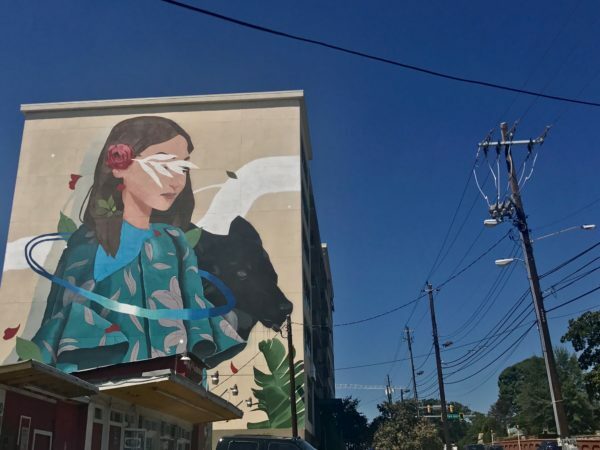 Spanish street artist Sabek has blessed our city with one of his nature-themed pieces, and it’s not hard to miss as you make your way down Memorial Drive. With his wildest dream to “paint the world,” Sabek brings his imaginative style to urban spaces around the globe. 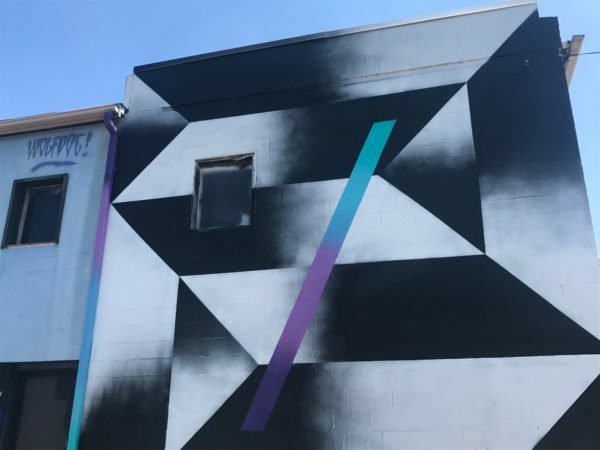 OSP brought three new murals to Atlanta’s Summerhill neighborhood. The first shows us what the multi-talented Dr. Dax has to say with his bubbly and aesthetically pleasing artwork. This is not the first time that this Atlanta artist has gifted the city with his creativity. From indoor to outdoor walls, Dr. Dax has made a name for himself throughout our urban community. 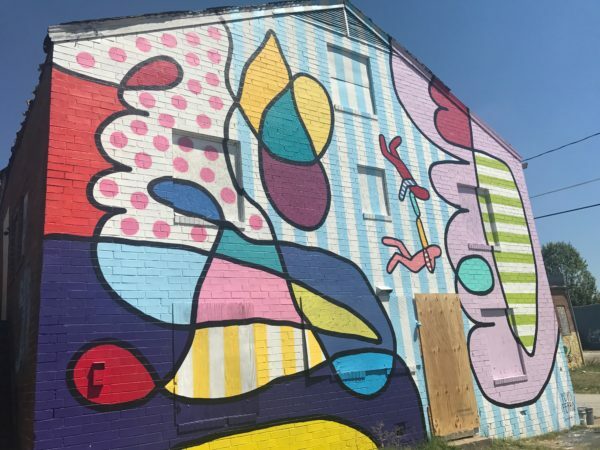 The colors are in full abundance, as Brazilian-born artist Yoyo Ferro further beautified this Summerhill location with his impressive three-story mural. Ferro has made a home for himself here in Atlanta, and a lot of his artistic pieces are inspired by the pride and love that he feels for his newfound residence. [Marchese] What were your hopes when you conceptualized the vision of the OSP? [Mike] I was travelling around the world and meeting a bunch of different artists globally, and painting at all these different festivals and I felt like Atlanta needed more of that. 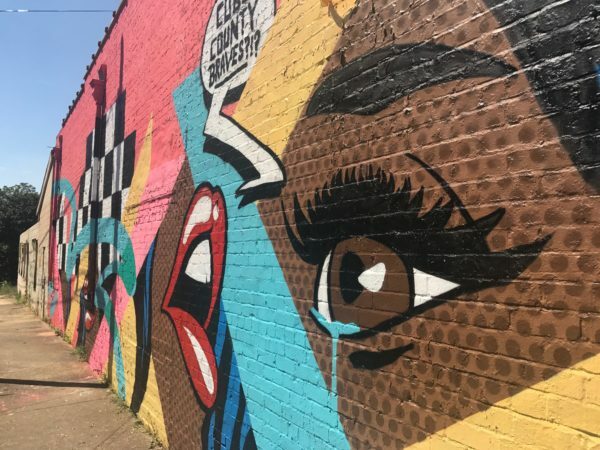 It needed the support locally…and I felt like there were a lot of artists from out-of-town that were always asking to come to Atlanta and paint a wall. So that was kind of my opportunity to take all the connections that I’ve made and give back to the city and help bring in new art. And put on the newer, up and coming artists as well. [Marchese] Do you freehand as you go or do you draw to scale beforehand and go from there? [Mike] Usually everything starts with an idea, then a sketch, and then I’ll digitize it. Then I’ll render out what it will look like on the wall in Photoshop. A lot of my work is very site specific because I come from a design background as well as studio art. I like to get in front of the wall and feel it out. A lot of times when I travel to different cities, I like to sit in front of the wall for 30 minutes to an hour and kind of feel the energy of the neighborhood. And make [the mural] work with what’s around—the colors, the shapes, the architecture—incorporating it all to work with the piece … A lot of times it’s about going up to the wall and letting it kind of speak to you—not forcing anything. Then going back and doing some rendering… Of course things are always going to change… creative spontaneity and all that. But it’s always good to envision it first.